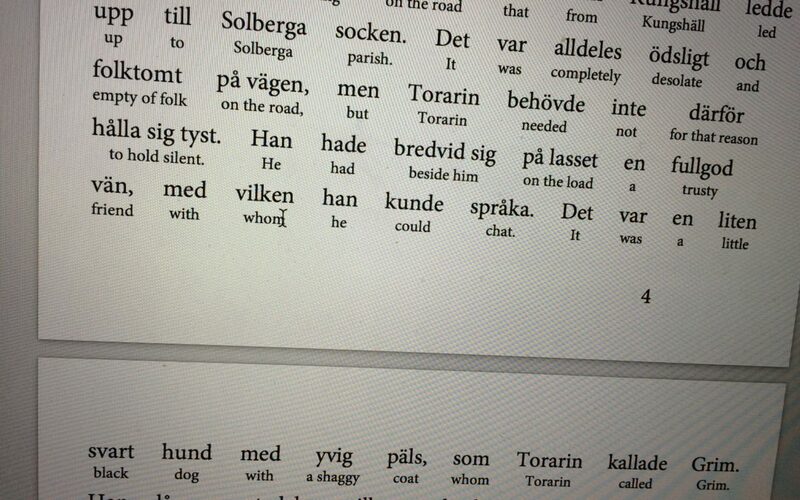 Should I read an interlinear book to learn Swedish? Do you know the concept of interlinear books? The concept is very simple. Any work of fiction or non-fiction is translated (as directly as possible, word by word) and you can read the translated version below each word. The target language, that is, the one you are learning, is printed in a larger font, whereas the translated version is printed in a smaller font, meaning it is relatively easy to navigate the page. I have recently re-read a classic, Herr Arnes Penningar, by Selma Lagerlöf, one of my favourite authors. The translators behind the English translation and the full interlinear book are Linas Vastakas and Dave MacLeod. As a native speaker of Swedish, I can’t say that there is any pleasure or benefit in reading this version of the book, compared to the standard, untranslated version. Instead, I get distracted by discovering new English words in the translation, that are in fact very old, considering that the original text in Swedish was written in 1904. I have never before come across the words palsied, scruff, or tan journeyman, and I am also really pleased to re-discover long-forgotten terms such as parsonage, harness, fishmonger. Now, I understand that such a book is not targeted at me, but at learners who are really keen to get into Swedish literature before they actually have the vocabulary for it. Reading an interlinear book will give you the chance to hang on to the translated version whenever you are losing track of the plot, or if one or two phrases is causing you confusion. Whether this is a viable learning method or pastime, I am not able to tell. I truly believe it depends on the individual, and their preferences. I do however see some pedagogic points in acquiring one or two of such texts, especially for Swedish language learners that have difficulty with grammar. The interesting part about the translation is that it is made word by word, meaning of course that the English is not following its own rules but the ones of Swedish. This means that already at an early stage you get a very good grasp on Swedish sentence structure, and also particularities of conjoined nouns and phrasal verbs. In general, the book is meticulously translated and made with great attention to detail. I speak both languages very well, and I did not find a single error in the 30 or 40 pages I read (the full book is 167 pages). You can read more about this concept, and even purchase an interlinear e-book through this website.